Our specification was for a super safe product that could not fall off our tripod or be easily caught on cuffs and the factory really delivered! Our gauze/mesh mat is not available elsewhere. While made specifically to suit our SC92000 stainless steel tripod the mats will fit other tripods with sides up to 145mm long. The mesh size on this mat is coarser than the SC92002 mat and will allow more heat through. The drawback may be the creation of hotspots if your bunsen burner does not provide an even flame. Use our SC92002 mat if hotspots are a concern. Because stainless steel is a poor heat conductor this mat is safer than iron ones. 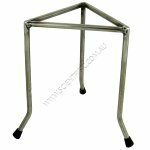 Suits tripods with sides up to 150mm long. Sold as a pack of 5. Beware a competitor who has used our image on their website! You will not be getting the product you expect! We will name and shame companies who steal our images to apparently insinuate their product is ours. Indicative photo of the Mesh Mat. 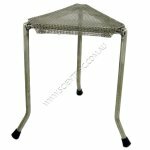 SC92000 tripod for use with Mesh Mat. Mesh mat fitted to SC92000 tripod.